Today is a big day for all iOS users and developers. Apple has introduced big changes to its softwares at its 25th annual World Wide Developer Conference (WWDC) and has already released betas for these operating systems. The company revealed OS X 10.10 Yosemite, iOS 8, several new and enhanced developer APIs, tools and even a new programming language called ’Swift’ to let developers efficiently develop apps for iOS and OS X. Here are the highlights of major features from today’s keynote. 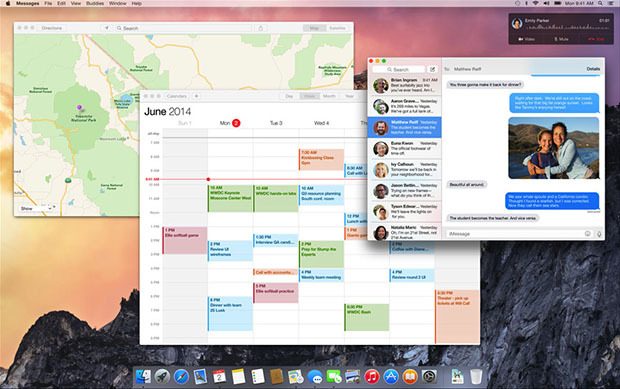 OS X 10.10 Yosemite: This WWDC focused mainly on OS X just like the last one did with iOS 7. Yosemite features the all new revamped iOS-like flat design. Other notable features include improved Notification Center with 3rd party widgets, AirDrop now supports iOS, a bunch of new tools called Continuity to make quick interactions between iOS 8 including making/receiving calls via iPhone, replying to Messages being received at iPhone via your Mac. You can also continue your document editing, mail writing, and browsing that you left on your iOS device from Mac and vice versa. iOS 8: The software update brings improved notifications finally allowing users to quickly reply to notifications by simply swiping down on the notification bar. Messages app brings a lot of new features to group conversations including naming groups, adding/removing people from chat, quick short voice messages and videos and more. Photos apps packs brilliant image editing algorithm to polish your dull photos. Just like OS X iOS 8 also brings 3rd party widgets to Notifaction Center. Another amazing feature is Apps extensions, that allows you to install different extensions to your apps. Safari also supports extensions now, which would help in boosting its functionality. A health app to track your physical fitness and to maintain the record of your blood pressure, heart rate etc has also been made part of iOS. Swift: It is a new programming language by Apple to develop iOS and OS X apps efficiently in a fun way. Swift is way faster than the Objective C however packs all the awesome features from Objective-C like ARC memory management, LLVM compiler, Optimizer and Autovectorizer etc. Develpers will be able to submit apps built using Swift as soon as iOS 8 and OS X 10.10 goes public. Availability: Developer Preview of new OS X and iOS 8 are available to registered developers right now. Whereas the public releases of iOS 8 and OS X Yosemite are set to release for fall this year. Non-developers can also participate in the OS X beta program and will start getting beta throughout summer. Compatibility: iOS 8 will be available for all devices running iOS 7 except iPhone 4. Stay tuned for more updates on latest software from Apple.